Going to a show? Call before you go! Make sure you check-in with the show coordinator or show website PRIOR to going to an event to make sure the event will be held as originally scheduled. The calendar relies on details provided by others and is listed here for your reference. Are you a show coordinator looking to promote your event? 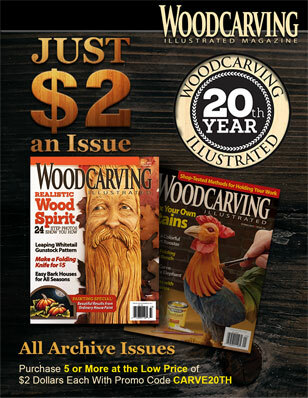 Woodcarving Illustrated publishes a general listing of carving shows in each issue. If you would like your show listed in our Calendar of Events, please send us your events’ information at the e-mail below. 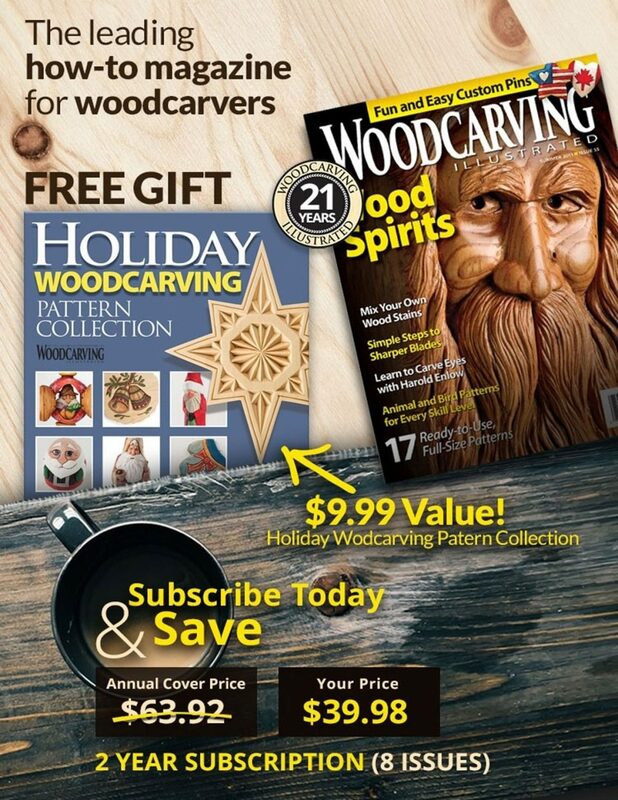 We will publish this in the upcoming issue of Woodcarving Illustrated as well as on our online calendar of events. Email event information to editors@woodcarvingillustrated.com or danielle.schagrin@foxchapelpublishing.com. Cactus Carvers’ Woodcarving Show. Sunflower RV Resort, 16501 N. El Mirage Rd. 9am-2:30pm. Free adm. Contact Bill Powell, wpowell4847@gmail.com. Oakhurst Woodcarvers’ Rendezvous. Oakhurst Community Center. 9am-4pm. $115 adm. for the first person, $55 for the second. Contact Larry Smith, 559-658-2405, woodtat@sti.net. Highlands Woodcarvers’ Woodcarving Show. Sebring Recreation Club, 333 Pomegranate Ave. 10am-3pm. $3 adm. Contact Eric Maron, 863-273-6136, efmaron@centurylink.net. Nature Coast Carving Club’s 4×4 Carving Getaway. Carroll Carvers Annual Festival of Carving. Robert Moton Center, 300 South Center St. 10am-4pm. $3 adm, children under 12 free. Contact Pete Turner, 443-798-0642, papasarmy@comcast.net. Artistic Creations in Wood. 876 Horace Brown Dr. 10am-5pm Sat., 10:30am-4pm Sun. $4 adm, 12 and under free. Contact Fred Azelio, 586-994-1146, metrocarvers.com. Kansas City Woodcarvers’ 2019 Elegance in Wood Show and Sale. The Pavilion at John Knox Village, 400 NW Murray Rd. 10am-6pm Fri., 10am-5pm Sat. $5 adm, 12 and under free. Contact Dan Robidoux, elegance@kcwoodworkersguild.org. Showcase of Woodcarvings. Central Piedmont Community College Central Campus, Worrell Building, 1228 Elizabeth Ave. Free adm. Contact Rod Gatlin, 704-529-1748, charlottewoodcarvers.com. Red River Valley Wood Arts Festival & Sale. Ramada Inn, 3333 13th Ave. S. 12-5pm Sat., 12-4pm Sun., $3 adm, 12 & under free. Contact Rhonda Smith, 218-839-4259, rrvwoodcarvers.wordpress.com. Lancaster County Woodcarvers’ Woodcarving and Wildlife Art Festival. Millersville University, Student Memorial Center. 10am-5pm Sat., 10am-4pm Sun. $5 adm, students and military free. Contact Jeff Pretz, jefpretz@ptd.net, lancarvers.com. Premier Woodcarving Event in North Texas. Grapevine Convention Center, 1209 S. Main St. 9am-4pm Sat., 10am-4pm Sun. Contact Doug Sandling, 214-564-9308, pjsandling13@gmail.com. Great Salt Lake Woodcarvers’ 27th Annual Show and Competition. Wheeler Farm, 6351 S. 900 East. 7am-7pm Thur., noon-7pm Fri., 9am-5pm Sat. $5 adm, $3 for seniors, $2 under 12. Kitsap County Woodcarvers’ Woodcarving Show. West Side Improvement Club, 4109 West E. St. 11am-5pm Sat., 10am-4pm Sun. Free adm. Contact Mark Campbell, 360-536-6155, kitsapcarvers1a@gmail.com. Tri-City Woodcarvers’ Association Artistry in Wood Show and Sale. Tri-Tech Skills Center, 5929 W. Metaline Ave. 9am-5pm Sat., 9am-3pm Sun. Contact Pat Hamilton, 509-430-3778. 206 N. Main St. 10am-4pm. Free adm. Contact John Sutton, 608-634-4396, bekkum@wrlsweb.org. Mar 9: BROOKLIN VILLAGE, ONT. Brooklin Woodcarvers’ Show and Competition. Brooklin Community Centre and Library, 8 Vipond Rd. 10am-4pm. Free adm. Contact Robert Woodill, robw1965@outlook.com. Mar 30-31: NIAGARA FALLS, ONT. Fun with Carving Show and Sale. McRoberts Secondary School, 8980 Williams Rd. 12-5pm Sat., 10am-4pm Sun. Contact Dan Lemire, 604-271-1389, richmondcarvers.com. Nova Scotia Wildlife Carvers and Artists Association Competition and Show. Cole Harbour Place, 51 Forest Hills Pkwy. 8am-5pm Sat., 9am-3pm Sun. Free adm. Contact Junior Gosse, 902-220-0520, junior.gosse@bellaliant.net.